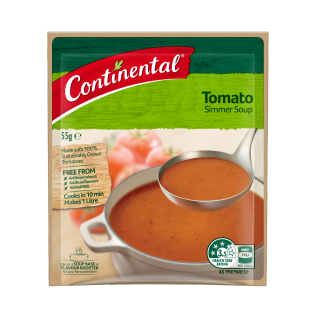 Try Continental Tomato Simmer Soup for a tasty snack and meal, or try one of our great recipes with it! Tomato^ powder (30%), corn starch, salt, creamer [vegetable oil (contains soybean derivative), glucose syrup, milk protein, mineral salts (339, 450)], sugar, maltodextrin, onion powder, yeast extract, garlic powder, food acid (citric), sunflower oil, herbs (parsley, basil), natural colour (paprika), celery seed powder, mineral salt (potassium chloride), natural flavour. Cooking Instructions 1. Empty soup mix into a saucepan with 4 cups (1 litre) of cold water and mix well. 2. Stir until boiling then simmer for 5 minutes, stirring occasionally.